As capitalism begins to emerge from the ‘Great Financial Crisis,’ there is good reason for working people to refrain from celebration. Though the roots of the crisis were in the private sector, it’s clear that the bill will be primarily paid via the public sector – which is to say that the costs will be placed on the working-class as both providers and recipients of social services. Moreover, although economic and political elites experienced a significant decline in credibility as a result of the crisis, popular movements – a few exceptions aside – remain on the defensive and are generally ill-prepared to respond. Most dangerously, as our weaknesses are exposed, and as pressures from business grow to ‘deal with the deficit,’ the government will likely harden its position and modest restraints will turn into more severe cutbacks. And so at a time when people will need more public programs and supports, they will get less. In Ontario, the recent $200-million cut to the ‘special diet program,’ to help people on social assistance buy fresh fruits and vegetables and other medically necessary dietary supplements, is one especially disgraceful example of this, after spending billions bailing out auto companies and supporting the financial sector. And at a moment when unions in the private sector are reeling from the job losses resulting from restructuring and globalization, it is their public sector counterparts – now at the center of any hope for reviving the labour movement – that are under the gun. Second, the Ontario government has attempted to create a wage freeze environment, that is, to orient workers and their unions to assume that wage and benefit gains are impossible. It has not done this by directly introducing legislation to open existing collective agreements or to directly ban bargaining gains. Instead, it imposed a two-year compensation freeze on non-unionized employees alongside stipulating that its ‘transfer partners’ (the various agencies and departments involved in bargaining with unions) would not be funded for any net compensation increases in any open or renewal collective agreements. Those employers would, of course, use that limit on funding to ‘reluctantly’ offer unionized workers only zero compensation packages. In 2010, approximately 850 agreements covering 134,000 public sector workers open for negotiation in Ontario. Among the first agreements up are many covering small social service agencies, represented by the Canadian Union of Public Employees (CUPE) and the Ontario Public Service Employees Union (OPSEU) and numerous university collective agreements of CUPE. Last year’s strikes at York University and city workers in Windsor and Toronto (all represented by CUPE) were difficult. 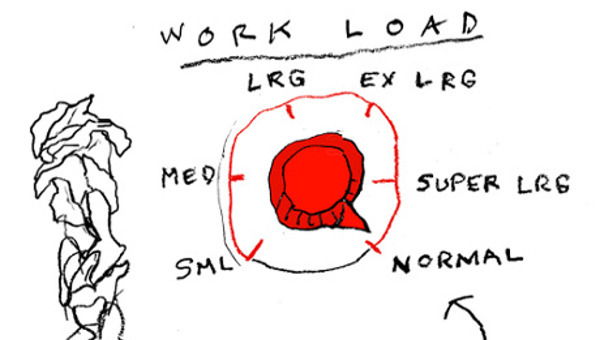 In the new environment, strikes will be all the more tough-going. An April 2010 OPSEU settlement of 0% and 0% for 1,200 Municipal Property Assessment Corporation (MPAC) employees with the right to strike may be suggestive of where OPSEU will be heading in sectors with the right to strike, including social services. At the municipal level (where employers can raise revenue through taxation) and in essential services workers (where unions have access to interest arbitration), the settlement outcomes may be different. Wage freeze regimes, like the Ontario government is attempting to impose, block workers from sharing in the output gains from productivity increases. As well, they prevent addressing the incredible shift in income distribution in favour of the richest groups in society since the early 1980s. How might unions effectively respond without becoming public scapegoats? The response from public sector union leaders – divided by politics, ideology, and bargaining territory but united in their caution – has been muted. Ontario Revenue Minister John Wilkinson has indicated that some kind of implicit accord has been reached with the union leadership already. Seven years of “unprecedented labour peace” between the Ontario government and public sector workers, he suggested, will see workers and their unions co-operate rather than fight with the government on the wage freezes. “I’ve been really surprised and kind of heartened … by the fact that people who are paid by the taxpayers, have all kind of indicated they understand,” he said. It may be tempting to recommend that unions who are too weak to resist wage cuts look to ‘trading-off’ wages for jobs. But if there is any lesson from the past, it is that when workers look to trade wages for jobs they generally end up with lower wages and fewer jobs. The reason for this is quite straightforward: it is one thing to fight for jobs and another to think they can be won out of weakness. If cutting public sector jobs is a government priority, they won’t reverse themselves unless public sector unions and allies are strong enough to force them to. A serious response would require a very significant mobilization – at a minimum creating new structures for bringing unions together. Unless this is done, militant rhetoric about defying the wage freeze is only posturing. It also risks leaving public sector union members more isolated, and therefore more vulnerable in the future, than before. But it also requires bringing the users of public services – the rest of the working-class – to our side. And that may mean going beyond general support for social issues; it may necessitate bringing that commitment into collective bargaining. In the 1930s – the last time the working-class went through comparable economic chaos – workers radically and creatively adjusted their strategy by developing sectoral-based industrial unions. 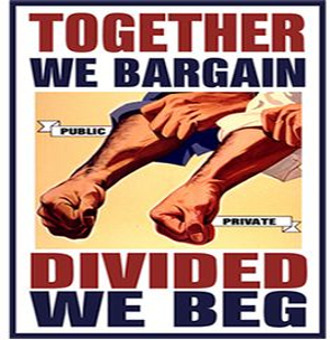 A comparable strategic adjustment for unions today would lie in transforming the confrontation from one between the workers and the individual employer, to one between public sector workers and the province by consolidating bargaining strength and moving into a strike position together. Although specific groups of workers may well have very legitimate wage and benefit claims and may win the occasional battle, the strategic issue today is not in fact wages. If jobs go, wages are secondary but if public sector workers lead a fight to protect and extend services, this not only addresses jobs but builds the community support for taking on future wage improvements. The strategic shift for public sector unions might be posed as follows: the government, by removing wages and benefit improvements from negotiations, is trying to dramatically narrow collective bargaining. What if the unions responded by expanding collective bargaining? What if public sector unions refused to settle collective agreements unless the settlements address the level, quality and administration of the services being provided? Unions have often taken positions on these issues, and a number of unions or locals have already moved toward greater community links. 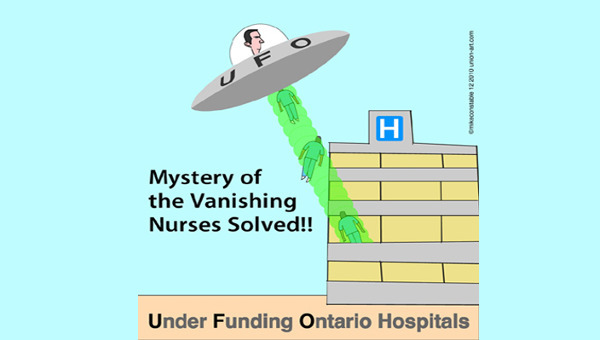 The Ontario Health Coalition and CUPE, the Ontario Nurses Association (ONA), OPSEU, the Service Employees International Union (SEIU) and the Canadian Auto Workers (CAW) have over many years been holding forums and mobilizing at the community level against healthcare cutbacks. The CUPE Toronto Hydro local has revived its previously successful campaign against privatization and is now extending that campaign to engage communities on the potential environmental leadership role of a publically owned electrical utility. The Amalgamated Transit Union (ATU) has been holding forums on transit services. CUPE workers in the Toronto education sector have been mobilizing at the community level against school closures. At the level of central labour bodies, the Toronto & York Region Labour Council, working with groups outside the official trade union movement like the Workers’ Action Center, held a successful series of community forums to win increases in the minimum wage. But going a step further and demonstrating the commitment of unions to improved public services by placing these issues on the bargaining table would represent a radical break in a number of ways. 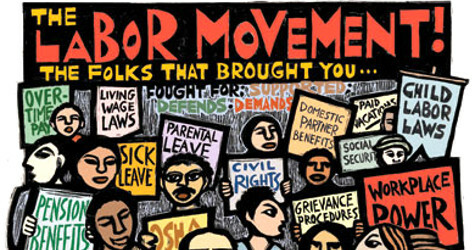 First, the labour movement would have a focus – something it is sorely lacking now. Rather than each bargaining unit going through the motions of collective bargaining and further fragmenting workers with the message that there was nothing that could be done (or that it could have been worse), there would be a new basis of potential unity and possibilities. All unions would place the broader demands on the table. Second, public sector unions would be leading the fight to preserve social services. Rather than letting the government and business isolate public sector workers as a cost that limits funds for public services, we’d be positioned to expose and clarify where the real problems lie. And by moving from progressive rhetoric to committed social action, there would be a basis to build the alliances that are fundamental to effecting change. Third, the relationship between unions and their members would be changed. For such a perspective to succeed, unions would first have to win their own members over. This means a real emphasis on internal education; the widest discussion with members on tactics and risks; and developing confident organizers to engage the community. The intense mobilization implied by this would, in other words, mean bringing union members into a new kind of class politics and a more substantive union democracy. Fourth, union structures would have to be transformed. Alongside any commitment to transform the content of union educational and democratic spaces, there would also have to be a reorganization of the technical supports that unions provide. Research and education departments would, for example, have to place relatively greater emphasis on the content of budgets and how expanded demands might be paid for; on the impact of the commercialization of public sector management on not just the level but the quality of services; and on alternative forms of management and delivery more sensitive to community needs. Fifth, tactical creativity would be encouraged. As important as it is to prepare better policies and plans for the public sector, this will not be enough. There is an overwhelming need for public sector unions to develop new creative workplace tactics. These need to be coordinated so that union and progressive issues are put on the agenda in a way that the governments cannot ignore, while also contributing to building more support for union and socialist positions amongst other working people. One such example is the Canadian Union of Postal Workers (CUPW) offering to continue to deliver pension and social assistance checks even if they go on strike. 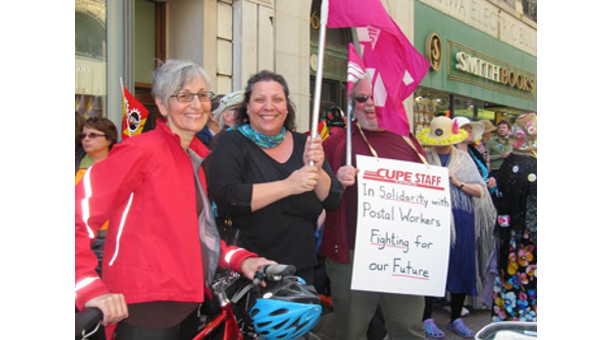 That action blocked the government from using the elderly and the poor as pawns against the union and highlighted the class dimensions of the strike – CUPW was fighting the employer and a postal system biased to corporations, not the general public. Another example occurred when the government tightened unemployment insurance rules to cut more people off. The Public Service Alliance of Canada (PSAC), which represented the workers administrating the program, prepared pamphlets for unemployed workers on how to answer the questions so they would not unfairly lose their needed income. The union was using its knowledge and skills to show class solidarity and prevented its members from being pitted against other workers. Transit workers declaring periodic free transit days when they don’t collect fares in order to highlight transit as a basic element of universal access to our city. Teachers and workers in the education sector fighting school closures by having a city-wide teach-in – during regular class hours and in lieu of a normal strike – to discuss schools as public spaces and alternatives uses for the facilities. Hospital workers coming in on a given day for a work-in to highlight staff shortages, and long-term care workers doing the same to demand 3.5 hours of care standards for long term care residents. Social workers organizing a teach-in with welfare recipients to discuss why they are put into positions of mutual frustration and what might be done about providing betters services and as part of this, more rewarding jobs). What Next Steps for Public Sector Unions? A starting point to get this on the agenda is to begin talking about it in workplaces, locals, unions, at labour councils, and at the OFL and CLC. Public sector unions and leaders need to ask ourselves whether we have a direction that is in fact taking us anywhere and if not, what – given the recent failures in protecting public sector services and workers – new alternatives might be. Putting our local executives in motion could follow, with an emphasis on using (or reviving) union structures to spread the discussion among the wider membership, develop networks across locals, get this on the agenda of the larger labour movement, reflect on how to more successfully reach the public, and strategize over how to disrupt the goods and services public sector workers produce in a way that advances our collective cause. These committees would need support. Some of this could be done internally. In other cases, public forums could be held across locals and unions to teach ourselves more about the public sector. This might include workshops on how far the cutbacks have gone elsewhere (so we see what may be coming); on how workers have resisted in other countries (to be inspired and get ideas); on the details of the Ontario and City budgets (so we can analyze and discuss them properly); on larger questions about the potentials and limits of financing public services in a capitalist society. At the same time, the various groups affected by cutbacks and ignored needs could organize to further the links among themselves as well as develop contacts with the labour committees. More ambitiously, at some point neighbourhood committees might be organized to discuss community services, infrastructure, transportation, the expectations of a democratized public sector, and many other issues. All this should not be restricted to public sector workers and community groups. Private sector workers have an interest not just in regards to union solidarity and not even just because social services are becoming more important as the door is closing to collective bargaining gains. It is also a question of private sector jobs and future security. If – as seems increasingly the case – the private sector provides little hope in the short term for decent working-class jobs, then the intervention of a more credible and democratic public sector becomes all the more important. The greatest current danger is that all of us as workers and unionists keep lowering our expectations of what kind of society is possible – and then lowering them some more. There is a desperate need to rethink where we are at and to transform what is a looming disaster into a capacity for renewal. There is a need to develop a new response. It will be risky and difficult, but there is no longer any denying that it is essential. One way or the other, this will involve workers seeing themselves as not ‘just workers’ but agents with the potential capacities to shape society and affect their lives. In particular, workers are part of a broader class that goes beyond public versus private unions, organized versus unorganized, employed versus unemployed and includes the poor. It is this relationship that lays the basis for effective alliances, and what it now concretely poses is rethinking how workers approach collective bargaining, especially at this moment and in the public sector.